Why does a contented, satisfied life feel so evasive? What deep hungers drive the reckless purchasing habits, out of control accumulation, and crazy consumer lifestyle for so many of us? And why are we often driven more by what our neighbors own than what will truly make us happy? For many in the recent economic financial crisis a series of lifestyle adjustments became necessary as hours were slashed at work and paychecks diminished. Vacations were simplified or canceled, even important purchases had to be delayed and any extras were put on hold. In the midst of paring back and cutting down there lies the critical question: Will a spirit of resentment and complaint invade our heart or can deep, inner joy prevail, even as our dreams seem to fade? Is it possible to live a deeply satisfied life as possessions and opportunities slip away? Followers of the Christ, living in the first century world, also wrestled with issues related to material longings. For Christians living in Ephesus, Philippi, and Laodicea, the tendency to find their identity through accumulation and comparison was alive and well. These powerful longings are addressed in numerous places in the storyline of scripture -- a storyline that points us toward material and financial sanity and the pathway to true abundance and deep satisfaction. 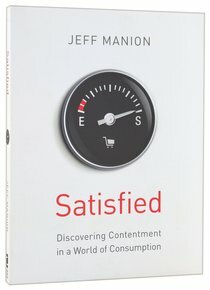 Satisfied will draw richly from seven passages of scripture, exploring the way in which these messages were received by the original readers and the way these passages can transform the way we view wealth, accumulation, and ultimate contentment today. Jeff Manion is Senior Teaching Pastor of Ada Bible Church in Grand Rapids, Michigan, where he has served for more than 25 years. He and his wife, Chris, have three children.